Residents now have an easy way to save money on auto glass repair. PG Los Angeles Auto Glass Repair now offers a website coupon that can be used for fast and professional auto glass replacement service. Every motorist needs a reliable choice when automobile glass damage happens. PG Auto Glass makes being prepared in advance easy and economical. Damage to automobile windows happens more frequently than most people think. The average driver places most emphasis on safety to the body, engine and tires of a motor vehicle. A broken or cracked window impairs driving ability and makes transportation unsafe. PG auto glass repair in Los Angeles gives residents 24/7 immediate service with quick arrival to any home or place of business. Office workers are at risk for damage to automobile glass compared with workers that use parking garages. Any car or truck that is left in an unattended parking lot for numerous hours at a time is susceptible to sudden damage or vandalism. PG Los Angeles auto glass replacement services are designed to make a quick arrival to any place of business when damage is reported. Trained technicians make a detailed inspection and estimations for repair or replacement are provided before work is completed. Being stranded on busy highways is dangerous for many reasons. Not every driver notices a stopped vehicle and collisions can create further damage. The mobile auto glass replacement services provided by PG Auto Glass eliminate the waiting period when glass damage happens. Professional and friendly technicians arrive to any location for car window replacement in Los Angeles. The safety of every motorist is important and just another reason why residents choose PG Auto Glass. As the premier provider of mobile auto glass repair services, PG Auto Glass assists area residents that have broken, cracked or leaking automobile windshields and windows by responding 24/7 for reliable emergency service. 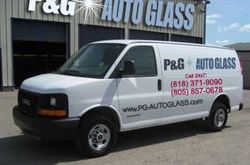 PG Auto Glass uses experienced technicians and guarantees window installations and repairs for life.